In the summer heat staying hydrated is even more important than usual. Fluids help flush toxins out of our organs, carry nutrients to our cells, can help keep blood pressure within normal range, provide a moist environment for ear, nose and throat tissues, can help lower your risk of heat stroke, and can help reduce summer headaches. Keep on top of dehydration by drinking liquids throughout the day, because once your body sends you the signal “I’m thirsty” you are already dehydrated. The amount of fluids you need is related to your age, gender and activity levels. Check out the Eat Right Ontario’s Guidelines for how much you need to be drinking. Water is always a good choice, but milk, coffee and tea as well as juice (in moderation) are good choices as well. Alcohol is a dehydrator, so if you are drinking some cocktails on a hot summer day, don’t forget to drink in moderation and drink re-hydrating non-alcoholic drinks as well. 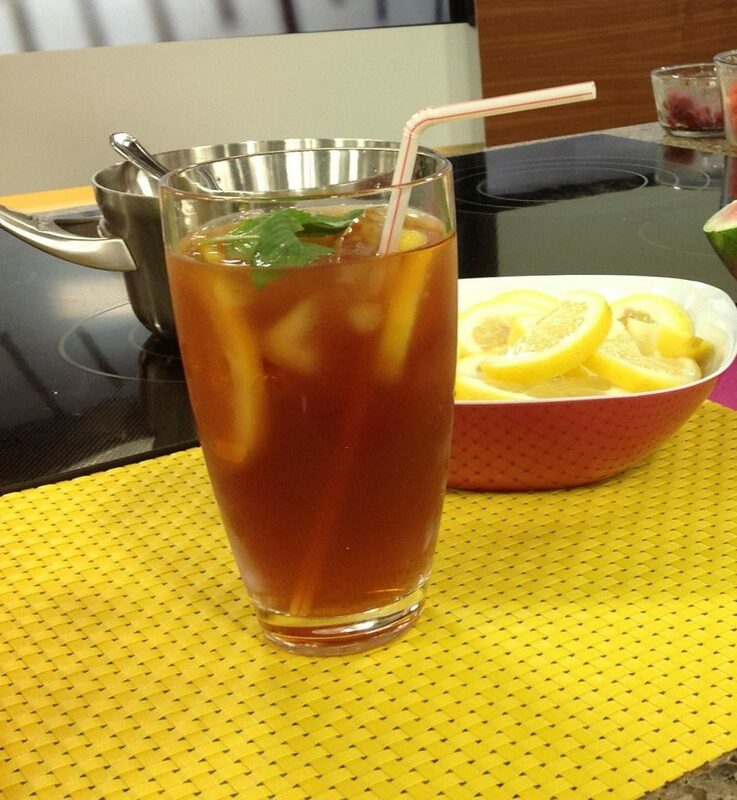 On a hot summer day there’s nothing like a glass of iced tea. And contrary to popular belief tea is not dehydrating. Commercial iced teas are loaded with sugar, sugar and more sugar plus the valuable antioxidants are destroyed in the processing. This recipe lets you utilize those antioxidants as well as decide on the sweetness level by adding your sweetener of choice, either stevia or a simple syrup. Although most people think of iced tea as regular tea that is cold, try being creative and brew a pot of ice tea with Earl Grey, Irish Breakfast or your favourite blended tea. I like making decaf as well as caffeinated for all the caffeine sensitive people in the crowd. If you drink really weak tea, this one maybe too strong, add extra cold water to your liking. Hot your clean 4 cup (1 L) tea pot. Fill a 10 cup (2.2L) jug with 4 cups (1 L) cold water. Stir tea. Gently squeeze tea bags and discard. Pour tea into the jug of cold water. Refrigerate until cold. To serve, add lemon and sweetener if desired. Pour into glasses filled with ice. This recipe has almost zero calories, fat, sodium, carbs, fibre, and protein. Place water and sugar in a small saucepan. Bring to a boil stirring until the sugar dissolves. Remove the pan from the heat. Add flavourings like mint leaves or chopped fresh ginger if desired. Cool completely, remove flavourings, pour into a jar, cover and store in the fridge for up to 1 week. Tea bags and leaves make wonderful food for your garden, those antioxidants just don‘t stop. I usually discard loose leaves around my plants. Tea bags can be torn open and the loose leaves can be sprinkled around your plants as well. Here’s to a healthy you and your posies. So glad you want to try all of the drinks. Check out O.N.E. website they have a retailer locator right in their site.